I’ve just come away from a Facebook post that I wish I could forget. I’m sure you know the kind of post I’m referring to… They’re pretty common these days. The ones that put an ache in your heart and fire in your veins and you just want to lash out and tell this commenter what you really think. My husband warned me not to read it. I should have listened. And I’ve found myself praying imprecatory psalms and I just want God to come and show this world how profoundly sick, ugly and evil it is. O come and judge in holy vengeance, Lord Jesus!!!! “My Jesus I love Thee,” written by William Featherston in 1864, is a beautiful reminder of how God loves us and we love Him in response. Jesus purchased our pardon when He suffered on the cross. Because of our Savior’s great love, we are free to love Him through life, through pain, through death and for eternity on the New Earth. We may be surrounded by darkness and evil. But I don’t want to forget that I was a part of that darkness until Jesus rescued me. Instead of stewing in anger, I will gratefully sing “My Jesus, I love thee.” Will you join me this month in memorizing this wonderful hymn? Chances are you know this hymn already. If it’s helpful to you, please use our YouTube Channel to hear it so you can sing it with confidence. 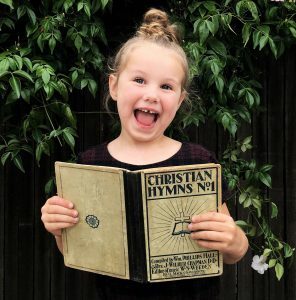 We’ve added several versions of the hymn to the top of our hymn of the month playlist for you to choose from. And don’t forget your free printable lyrics, music, and a copywork page to help you along. We encourage you all to gather up your families, for just a few minutes each day, to sing, discuss and memorize this hymn, whether it is during family worship, or before bedtime – whatever works best for your family. By the end of February, you are encouraged to post either a photo or video inspired by the song on Instagram. Every time you post, you will be entered into a drawing for a little something special. Just tag your post with #hymnofthemonth. If you have any questions, please don’t hesitate to ask! Let us know if you’ll be joining in!